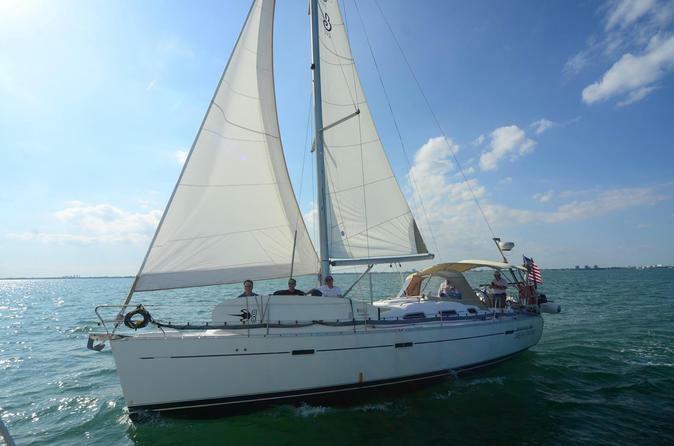 A perfect way to enjoy a day is sailing on a beautiful 40 foot Beneteau sailboat on Biscayne Bay in Miami. The most popular charter is a sunset cruise. However, any time of day, any occasion, is perfect to spend on the water. Captain Bill will accommodate your interests, so be sure to speak with him about customizing your cruise. Please note: Price listed is per boat, so you will only need to select one adult for your booking of a maximum of 6 people. There are various itineraries to chose from, depending on your interests. One option is to leave Dinner Key Marina toward Key Biscayne. Then head east to view Millionaire’s Row where President Nixon’s house was when he was in office. Another option is setting a northerly course toward the Miami skyline. On this course we would pass Vizcaya, the estate constructed to mimic and old Spanish villa, built by the owner of International Harvester. Sit back and enjoy a glass of wine or beverage while enjoying the views and sailing. For the more adventurous, help sail the boat by taking the helm or working a winch. Impromptu sailing lessons are always available from Captain Bill.